As Germany’s leading advisory group on the bioeconomy this week urges fresh legislation on gene editing, is it time to reflect on new ways to support and communicate such powerful new technologies and the bioeconomy they promise, asks Susan Watts. “We should all be doing less. 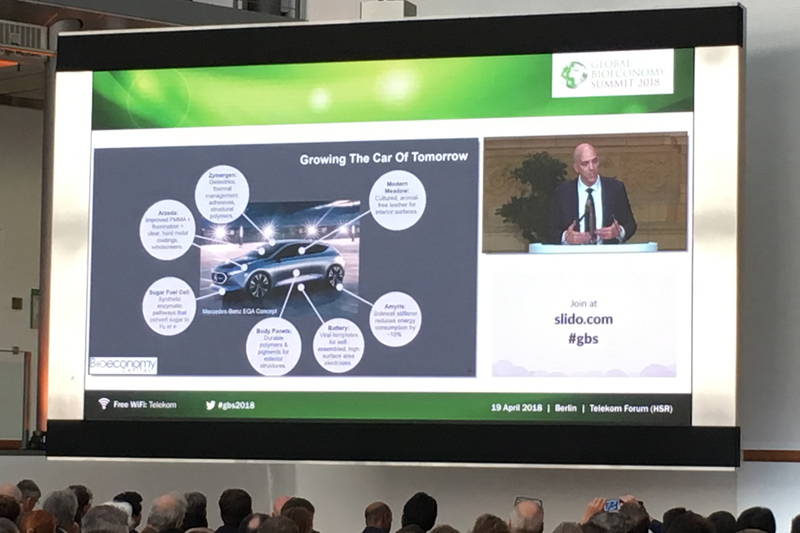 We all need to chill.” It wasn’t an obvious rallying cry for delegates at the second Global Bioeconomy Summit in Berlin, but it was a reasonable summary, albeit a light-hearted one, of the underlying sentiment of the two-day meeting organised by the German Bioeconomy Council. John Schramski, associate professor of engineering at the University of Georgia, did not mince his words in his talk to delegates. His message? That the world is in a state of “Global Acceleration”, that there is “no wiggle room with the laws of thermodynamics”, that civilisation’s dominant conflict with nature is energy consumption, and that we need to stop and revert to a restorative mode. In short, he said, we are discharging the Earth’s battery and need to re-charge. His was the dominant theme, echoed throughout the summit, held in central Berlin’s glitzy Telekom Forum building this April. The event brought together some 700 high-ranking representatives from politics, science, civil society and the business sector and from more than 70 countries to discuss the latest developments and challenges in the global “bioeconomy”. Schramski’s drumbeat resonated beneath plenary sessions on how the world can stay within “natural” boundaries to avoid the more catastrophic of potential futures, possibly even a collapse of civilisation. It ran through workshops on subjects as diverse as disruptive trends in marine aquaculture and the blue bioeconomy, to how to encourage a switch away from fossil-based to bio-based manufacturing, to ways to slow nutrient loss in the world’s soils. But if the bioeconomy is going to fix anything, it will need to be communicated much more simply and clearly to the wider public, a theme also acknowledged in several of the sessions. Definitions vary on what the bioeconomy actually is. Here’s the German Bioeconomy Council’s: “the knowledge-based production and utilisation of biological resources to provide products, processes and services in all sectors of trade and industry within the framework of a sustainable economic system.” But few of the passers-by in the street outside the summit building would likely have come close to that definition if asked. The difficulty of engaging the wider public in this rapidly evolving sector formed part of a workshop convened by Achim Dobermann, Director and Chief Executive of Rothamsted Research, who became a member of the summit’s International Advisory Council for its inaugural session last year. Alongside co-chair Ben Durham, chief director of bio-innovation at the South African government’s Department of Science and Technology, the pair’s workshop on “Transformative Science and Communication” brought together four themes: the nature and power of gene editing; the likely commercial outputs in the development of genetic engineering; the current best practice in biosafety management and regulation; and models for enabling translation to socially acceptable applications. The themes were explored by four speakers, from Germany, the UK and South Africa: Bekir Ülker, CEO of Agrojector; Johnathan Napier, a plant biotechnologist at Rothamsted; Hennie Groenewald, Executive Manager of Biosafety SA; and Julian Kinderlerer, Emeritus Professor of Intellectual Property Law at the University of Cape Town and a member of the European Group on Ethics in Science and New Technologies (EGE). Their talks generated some lively questions and comments. • Seek to ensure the technologies are both accessible to a wider pool of developers (through fair, reasonable and non-discriminatory principles) and result in products that are more directly relevant for the everyday consumer. The Conference Report has now been published, and it’s timely. It comes as the bioeconomy sector reels from this summer’s ruling by the European Court of Justice on genetic modification, widely seen as one of the most significant for many years, with potentially profound implications for the future of the bioeconomy. The ruling states that gene editing (GE) should be governed by the same regulations as genetic modification (GM). GE speeds up traditional breeding processes, allowing insect or disease-resistant varieties of crops or breeds of animals, for example, to be developed quickly by replacing one DNA sequence with another. Unlike GM, no foreign DNA is inserted into a gene-edited organism. The rules surrounding GE had been unclear until the ECJ ruling, and scientists and industry are now seeking reassurance that its effect will not be to hold back this area of science, as voiced in an open letter this month to the UK government’s environment secretary. And the German Bioeconomy Council has been proactive on this too. Just this week it has published its reaction to the ECJ ruling. This is not insignificant, given that the council reports directly to the German Ministry of Education and Science. The council calls on policy-makers to modernise genetic engineering legislation so that it distinguishes between mutations and gene transfers. In the council’s view, GE will catalyse important innovations in the bioeconomy. Gathering lots of people in a room does not solve these things. In a straw poll, delegates had a number of reasons for attending: one, to identify new sources of money to invest in their small agricultural science company; another, to find women speakers for future conferences; and another, to find out how the Bayer-Monsanto merger might work. But the bigger issue remains. To discover ways to ensure that by the time the next summit meets, and the first one was in 2015, more people walking past on the street outside are equipped not only to define “bioeconomy” but are even, just maybe, motivated to support it. Susan Watts is Head of Communications & Public Engagement at Rothamsted Research. She attended the Global Bioeconomy Summit as rapporteur to the workshop, “Transformative Science and Communication”.